No, I haven't had a fight with a paint pot, just pitting a cherry! It's fresh cherry season and there's nothing better than picking or buying them straight from the farm. Try making a fresh cherry pie, very easy once you've pitted the cherries! If you are using an old fashioned stoner like mine, make sure you wear an apron and some plastic gloves, or you will look like you've been taking part in a fight by the time you've finished! Once you have pitted the cherries, mix in the sugar, flour and cinnamon. Roll out half the pastry to fit the bottom of a deep, 9" tart pan, I like to line the bottom with some non-stick baking parchment. Spoon in the cherry mixture and roll out the rest of the pastry to cover the pie. Brush the edges with a little beaten egg to make sure the edges of the pastry stick together. Brush some more egg over the top of the pie, sprinkle with some coarse demerara sugar and cut a couple of vents in the top with a knife. Bake in a medium hot oven, 180º for about an hour, until the pastry is nicely brown and cooked underneath. Serve hot or cold, with cream or ice cream. Wow - lots of cherry pie recipes floating about at the mo. Looks great, very tasty. Yay for cherry season. I usually purchase Bings so not much are leftto make pie after I get hold of them:D Cherry pie is my mom's favourite!!! OMG It is gorgeous!!! The pictures are beautiful, Nic! And that pie is perfect! Cherry pie must be one of my 5 favorite desserts of all times and I last made mine with cornstarch instead of flour and is was all runny. Yours is perfect! On my list!!! That's a seriously gorgeous pie Nic... love the pictures too. hats off to you for being able to click some while working with these colourful creatures! Gloves and aprons are in order here too! That pie looks sensational! Gorgeous pie, and I'll bet it tastes divine! 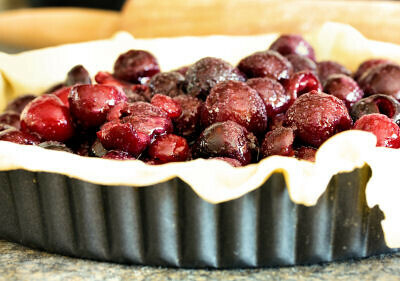 I love cherries and at the moment they are every where and this pie just looks so so yumm. 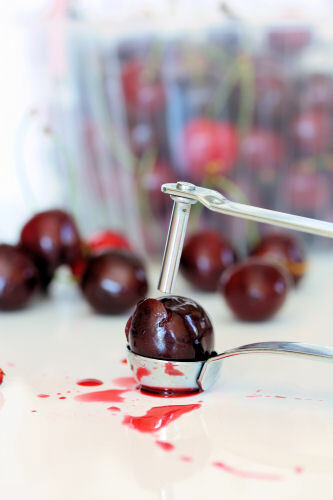 I find a cherry pitter invaluable, I don't think I'd bother cooking with cherries if I didn't have one. You've reminded me I've not had any yet this year! Great pie, you'll have Julia Parsons chasing you. 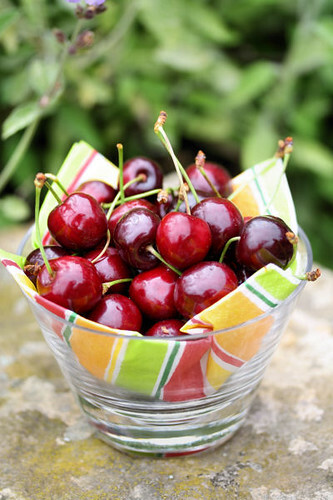 you're making me want to stop munching on this bag of cherries so I can bake pie tomorrow. This has made me want to go cherry picking, pie looks delicious. 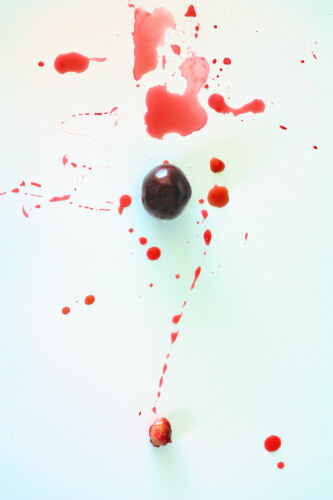 I love your second photo of the cherry juice and pip, very artistic! Stunning pictures! Pie looks fantastic! Wow it looks divine! Beautiful colours and so tasty. I've never used a cherry stoner, will be careful if I do by the sounds of it! The pie looks perfect Nic, bet it tasted gorgeous too! Oh yum. That looks delicious. My white wall is still sprinkled with cherry juice from last year's jam making session! Cherries everywhere!! I still cannot have enough of it. 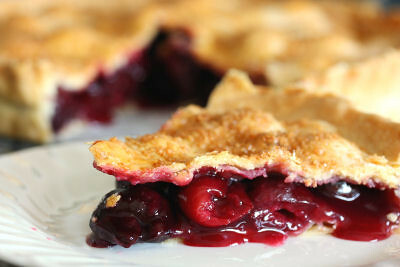 Love fresh cherry pie and yours look vivaciously good. 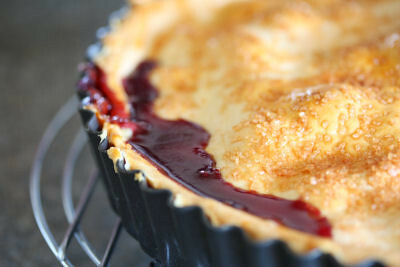 Love the picture of the deep red juice oozing over the pie! The cherry pie looks very tempting! I too use an old fashioned cherry pitter, but it still somehow manages to spray my kitchen with cherry juice. 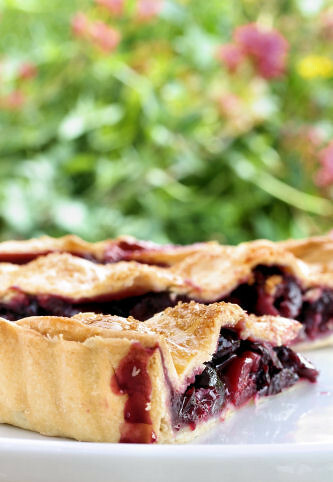 The cherry pitting photos look great (as does the pie)!